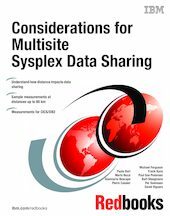 This IBM Redbooks publication provides a broad understanding of the considerations to keep in mind when you implement IBM z/OS sysplex data sharing across geographically distributed sites. This is a relatively new technology with many complexities, so it can be challenging to understand and accurately predict how its implementation might affect the performance and capacity of your environment. To promote that understanding, we measured and documented a number of workloads over various distances. In this book, we discuss in detail how the performance changed in each case, and why we experienced the results that we did. While it is not possible to accurately model the impact of distance on data sharing, by providing a discussion of our results you will be better prepared to undertake a similar project yourself.